This review's in verse, I kid you not - go ahead and read it, give it a shot! leave thirteen, all suffused with content galore. Why? Let’s not tarry and read more! even though I’ve reviewed more than a score. and on others, you’ll find mechs, laser-mounted. reigns but one principle: Poetry is life. This whole book is written mostly in verse! there is power is the lowliest staves. courtesy of the fair poet’s powers and that of their muses. but rules are provided for these roles and their uses. thus comes to life each of their stories. Mary Fair, of Copper Hair, commands legions, diverse and endless. silent, as a hand on purest, cold, silk. Beyond the lands of far and wide, this land sports a nasty, mystic pox! It scavenges your mind and rattles your thoughts, makes you want to eat your socks! as your poetry crashes and you try oh so hard to correct it. In this world that’s governed all by verse. you’ll only be greeted with a sneer and a frown. but to visit instead, Ceasura’s Chasm? where in absence, silence sings. 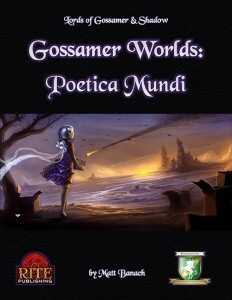 of rules of the world Poetica Mundi. Editing and formatting are top-notch, I noticed not a single botch. and you don’t have to be a scholar to appreciate art most gorgeous, all in color. there’s a bookmark for one and all. had me cackle with glee like a manic. shill out the low asking price from your purse. if this were bound paper, I’d kiss its spine! 5 stars plus seal from this German guy. to get it here, on the pathfinder SRD’s shop!